In any Civics or Government class any student has ever taken, one fundamental concept learned was that of checks and balances. More often than not, it seems to work out. We haven't really had to worry about the loss of the democratic process....until lately. Looking around, the laws of our country are being reshaped to favor those with corporate power and money versus the average citizen. Sadly, the checks and balances we relied on with the judicial branch, the Supreme Court, failed us when corporations suddenly were deemed citizens by the law. 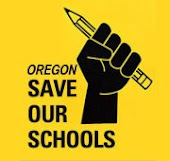 Here at Oregon Save Our Schools, we have been watching as the corporate education reform model with ties to ALEC and the Oregon Business Plan Playbook swiftly erode our democratic public school system as well. When our Governor seeks a special session for Nike rather than one over education, one starts to see that the values of our state seem to have shifted, and not for the better. Furthermore, a pattern has become clear with our Executive branch when one looks at such examples as education reform and funding, and now Nike: our Governor has his vision, his ideas, his values, and he will get them through one way or another --nevermind the democratic process. We are in danger of losing our precious system which makes democracy work in Oregon when we continue to have decisions made by threats, summons, and with the dismissing of the public voice. We have checks and balances for a reason: to keep one branch of our government from having too much power. Recently, as our legislators came back for a special session for Nike and the Governor, decisions had to be made and quickly. Amazingly enough, even the public was able to organize itself swiftly to share their opinions and concerns regarding the goal of this session. Legislators had to make sudden decisions with limited information and pressure from the Governor to make this happen for Nike. And it was notably, a hard decision for many of our legislators. Many did try to affect change in a short span of time. But it was tough. Still, in the end, there were a few who stood up to such a process and recognized that our democracy is really what was at stake here. Oregonians are typically for the public, for compromise, and for respect of all voices who have something to say. We usually try to think things out and make reasonable decisions we can all live with as a community of Oregonians. More legislators should have stood up to Governor Kitzhaber and Nike on the grounds that this process was not okay. This was not an emergency. We need to take our time, think things over, discuss pros and cons while not under such duress or short time frame. And the next big decision for our legislators will be about our public education system: do they question the Governor and the OEIB or follow his plan out of fear or politics? Will education get a special session? Hopefully, our leaders have learned from this. Hopefully the discussion and decisions made regarding the vision and values of our public education system will be given more thought, research, and consideration. Hopefully good questions will be asked. Hopefully the voice of the public will be honored and valued. Hopefully enough time will be taken to think things through. The public should not condone fear-based decision making. We should not agree to handing over power to one branch of our government. We as Oregonians can do better than that. We're a smart group of people. But we are beginning to lose our way. The public is depending on our legislators to provide some checks and balances that are necessary to retaining a healthy democracy. Let's get back to being an Oregon that takes care of its people in this next session.